Consider this post an exercise for myself. 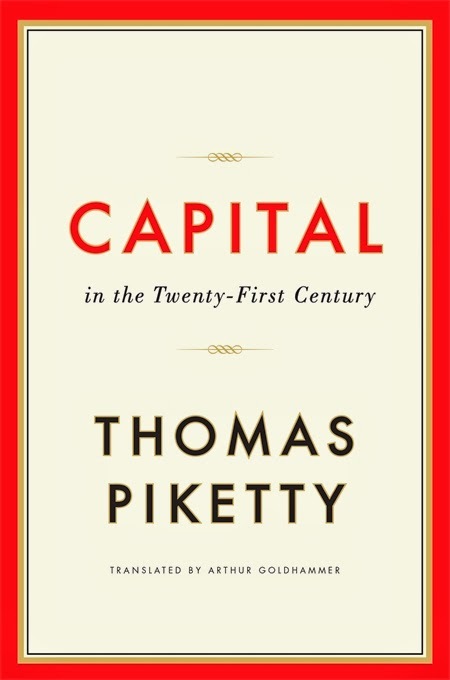 I just want to keep track of some of the initial, astonishing response to Thomas Piketty's book. I noted a long review by Robert Paul Wolff here some time ago. But the responses have been coming fast and I want a central place to store links. I will add more links as necessary. In any case, you can find reviews by Tyler Cowen at Foreign Affairs (May/June 2014), James Galbraith at Dissent (Spring 2014), Paul Krugman at NYRB (8 May 2014), Timothy Shenk at The Nation (5 May 2014), and Robert Solow at The New Republic (22 April 2014), as well as a troika of short commentaries by Jacob Hacker and Paul Pierson, Heather Boushey, and Branko Milanovic at The American Prospect (10 March 2014). And, of course, there was an extended pre-publication discussion by Thomas Edsall at The New York Times (28 January 2014). Update (6 May): Here is another review by Doug Henwood at Book Forum, yet another one by Robert Skidelsky here at Prospect, still another here at The American Prospect by Robert Kuttner, a fourth here at The Boston Review by Mike Komczal, and a commentary here by Brad Delong on the right-wing response to Piketty. Update (14 May): Another handful of commentaries: Deborah Boucoyannis; Thomas Edsall (again); Thomas Frank; John Judis; Dani Rodrik; Kenneth Rogoff; Robert Schiller; and Lawrence Summers. Update (16 May): More commentary - from the right, grumbling from Martin Feldstein here at the WSJ; from the left, some grumbling by Alex Callinicos here at Socialist Worker.